Southern States Cooperative, an agricultural supply cooperative with over 1,200 retail store locations in 23 states, wanted to increase the number of store location searches conducted on its website in order to drive more in-store visits, primarily to locations selling livestock feed. Paid search campaigns on AdWords for general livestock feed, bulk feed and the Southern States brand were initially driving traffic to a “Feed Headquarters” page, which displayed the different types of feeds offered and featured a Flash “carousel” of animals to choose from (Figure 1). While a fun and interactive concept, it was not driving the conversions Southern States wanted. In addition, campaigns for the various specific types of livestock feed were driving traffic to product pages on the Southern States website (Figure 2). Marketing Mojo hypothesized that by bringing the landing page back to basics – removing distractions not related to the conversion actions and focusing on Southern States’ top selling products – would increase conversions. 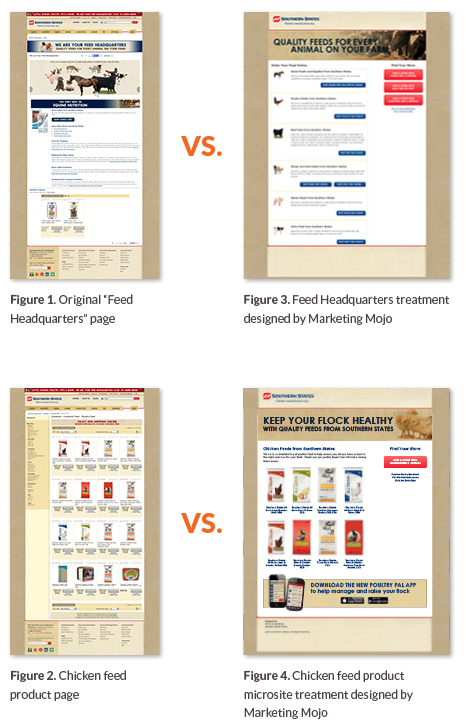 With this hypothesis in mind, we designed a pared-down Feed Headquarters landing page treatment (Figure 3), as well as a product microsite to test for the specific feed types (Figure 4), both of which were designed to give more visibility to the Store Locator conversion action. The original landing pages were used as the controls, which we tested against the treatment landing pages over the course of 30 days. Marketing Mojo’s Feed Headquarters landing page treatment resulted in a 79% improvement in conversions over the original landing page. The feed type product microsite for chicken feed also resulted in not only a 77% improvement in store locator conversions, but also a 55% improvement in total aggregate conversion actions (which included visits to coupon pages, coupon printing, visits to the current store ad circular, and visits to local store microsites). Based on this result, we continued to run the improved Feed Headquarters landing page on Southern States’ branded, livestock feed and bulk feed campaigns. Over 6 months, the conversion rate improved by over 160% while the cost per conversion decreased by 64%. Equine feed: 53% lift in store locator conversions and 30% improvement in total aggregate conversion actions. Cattle feed: 102% improvement in store locator conversions and 15% improvement in total aggregate conversion actions. In addition, the improved feed landing pages lowered the cost-per-store location search by 37% over 6 months.